I'm so glad that you reviewed this because I'd been looking at it on Amazon for a year and wondering if it was worth it. Sounds kind of like what I expected but probably worth a read. Thanks! Where haven't you been? I'm not a fan of Angelina Jolie, but I am a fan of the good work she does. This makes me feel a little better about Ms Jolie. That whole getting together with Brad Pitt thing really put me off her. It's good to hear that she has some good qualities. Human like the rest of us, though right? we all have good and bad points. 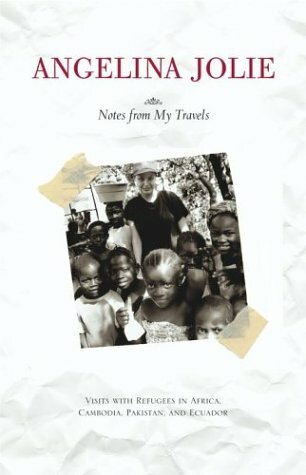 Years ago I thought that Angelina Jolie was a very strange person, but having learned about her dedication to those in need, I'm interested in learning more about her! I always have great admiration for Jolie and I think she's an incredible woman. This is one book I'd love to get my hands on and I'm glad you reviewed it. Thanks, Lenore! I really want to read this one too. I admire her work and I am interested in reading her point of view. Her mechanism against the warmth makes me laugh, because I do the same thing in reverse in the cold winter days, thinking of the beach and palm trees! I had no idea that this book existed. I'm so glad you reviewed it to bring it to my attention. Even if it's not well written, especially after reading your review, I would be very curious to read it. I've never heard of this book before which is hard to believe given Jolie's star status. I've always had the impression that her work with refugees was genuine and it seems that it is which is good to know! Glad to have you back from your trip. Blogosphere ain't the same without you, you know! Very interesting looking book. I, too, had no idea that she had written a book.